I only began researching the great American Solar Eclipse of August 21, 2017 about a year earlier and didn’t get serious about photographing it until November. 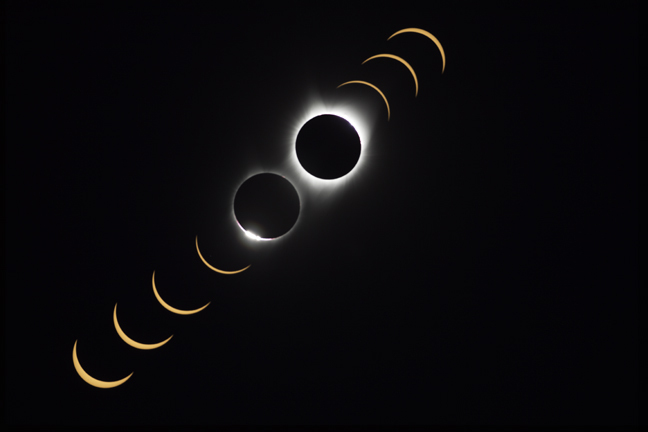 The fact that it was going to occur on the first day of classes of the fall 2017 semester was unfortunate since I knew that I had to be back the next day, but it was the first total solar eclipse to traverse the entire country since 1918, only the 15th to affect a portion of the continental United States during the past 150 years and the first since 1979. 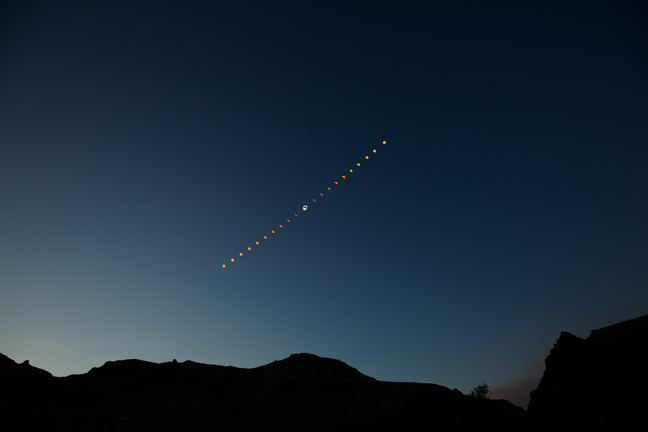 I photographed the 1984 annular “diamond necklace” solar eclipse and was a photo assistant for the 1979 total eclipse, so I was determined to be in totality on August 21. Since I do a lot of work with the National Park Service, I knew that I wanted to be in one of the 21 possible locations that would witness totality. After consulting weather charts, I narrowed the list to four: John Day Fossil Beds National Monument, Craters of the Moon National Monument, Grand Teton National Park and Scott’s Bluff National Monument. I also knew that I wanted to be on location a few days in advance to scout locations and that I didn’t want to be overwhelmed by massive crowds and traffic. 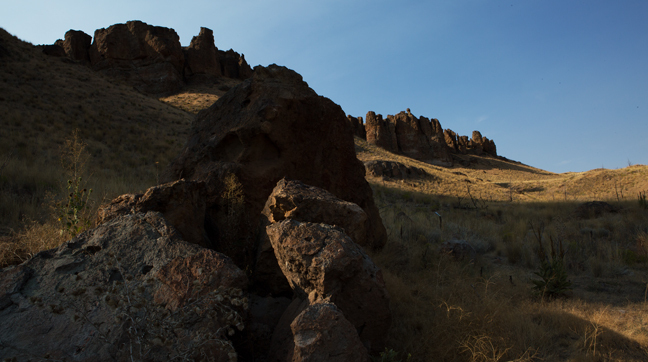 I chose eastern Oregon adjacent to the Sheep Rock Unit of the John Day Fossil Beds National Monument. It was only a couple of hundred miles east of the Portland International Airport and I was able to rent a flat with a kitchen six miles away in Dayville, a town of less than 200 people on the John Day River. Dayville had been an important stop along the Dalles Military Road during the last half of the 19th century that connected The Dalles to the goldmines near Canyon City. It has a mercantile, although no grocery store, an excellent café, a gas pump and a few hundred very friendly people who welcomed eclipse chasers without price gouging. Even one lady who flew both a Confederate flag and a Trump banner in front of her house showed great concern that her pit bull not attack us. 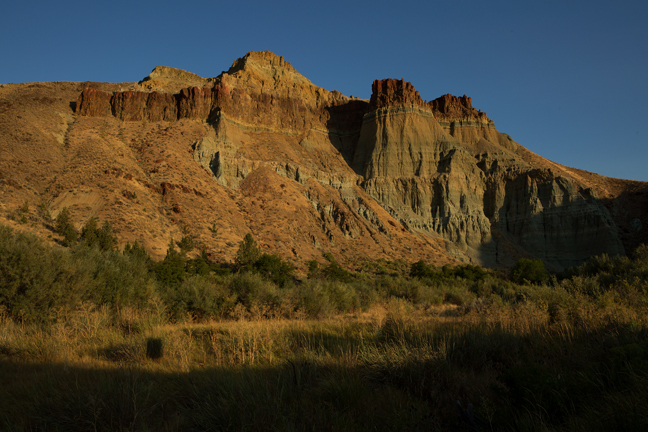 The John Day Fossil Beds National Monument is known for its well-preserved layers of fossil plants and mammals that lived in the region between the late Eocene, about 45 million years ago, and the late Miocene, about five million years ago. Paleontologists have studied the fossils in the region since 1864, when Thomas Condon, a missionary and amateur geologist, made them known globally. The Monument is divided into three noncontiguous units and all three would see totality. We visited all three and decided to stay in Dayville for the eclipse. 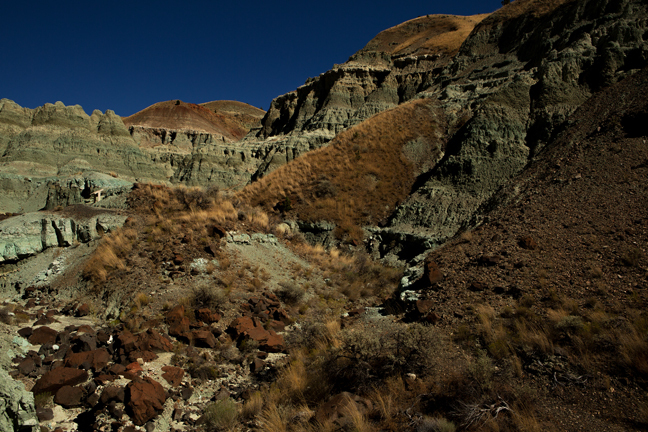 The John Day Fossil Beds National Monument is known for its well-preserved layers of fossil plants and mammals that lived in the region between the late Eocene, about 45 million years ago, and the late Miocene, about 5 million years ago. Paleontologists have studied the fossils in the region since 1864, when Thomas Condon, a missionary and amateur geologist, made them known globally. The Monument is divided into three noncontiguous units and all three would see totality. 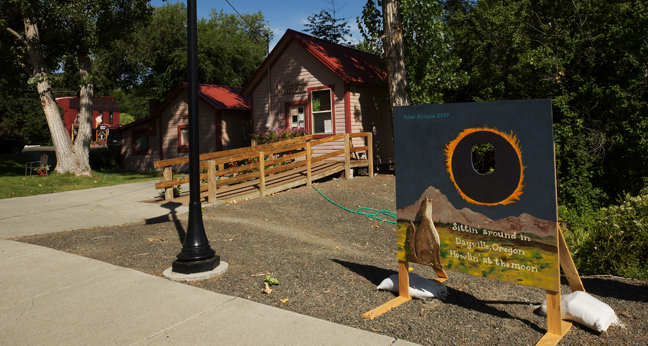 We visited all three but stayed in Dayville for the eclipse. 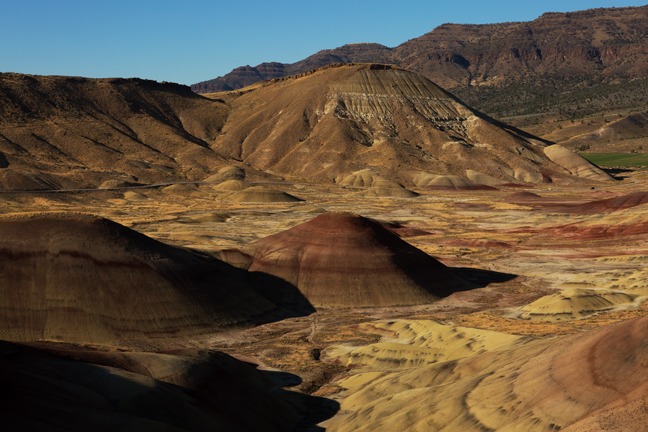 The Painted Hills Unit is located about nine miles northwest of Mitchell, OR. 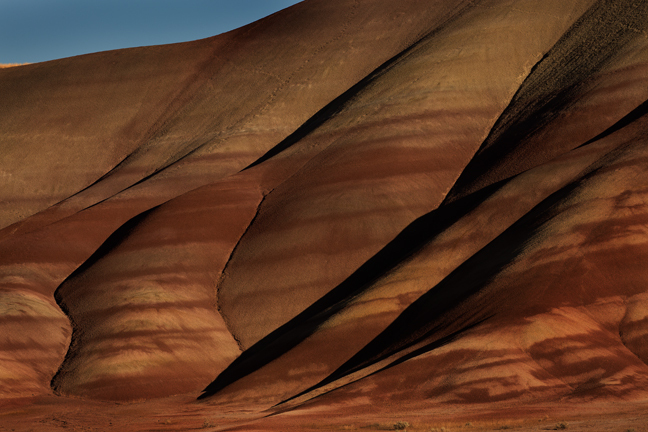 The red, tan, orange and black striped landscapes reveal a sequence of past climate change. 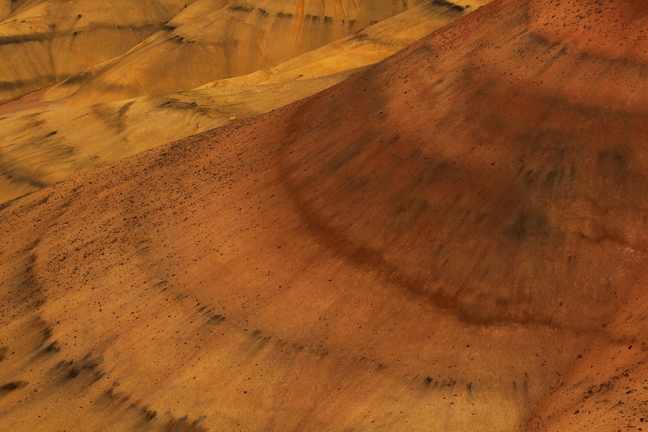 The Painted Hills contains a diverse variety of 30-39 million year old leaf fossils. 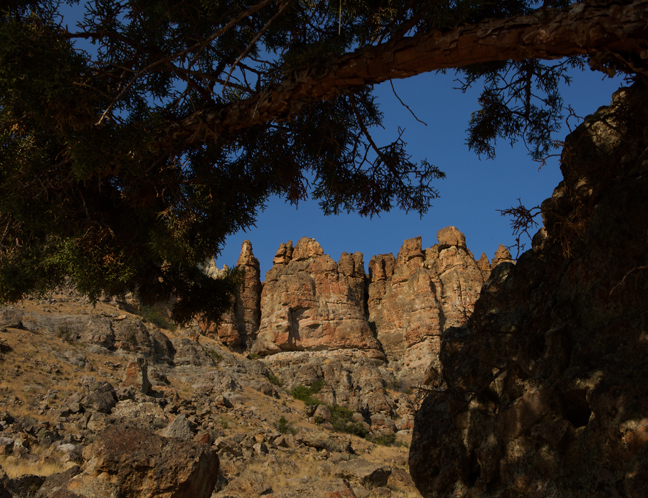 The Clarno Unit is located 18 miles west of the town of Fossil, Oregon. The Palisades, volcanic lahars that formed 40-50 million years ago in a lush semi-tropical rainforest environment are the most prominent landform. Fossils of small four-toed horses, rhino-like brontotheres, crocodilians and meat-eating creodonts are found in the rocks of the Clarno Unit. Leaves, fruits, nuts, seeds and petrified wood from 173 species of trees, vines, shrubs and other plants have been found as well. 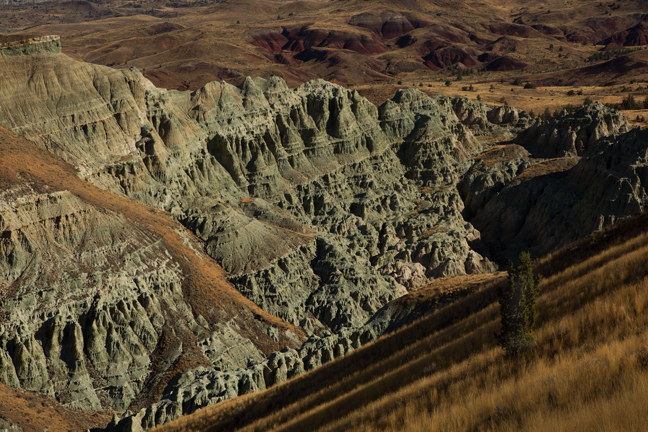 The Sheep Rock Unit is adjacent to Dayville and features green claystone layers dating back more than 35 million years. The rich green color was caused by chemical weathering of a mineral called celadonite millions of years ago as water moved through the alkaline ash beds under high pressure. 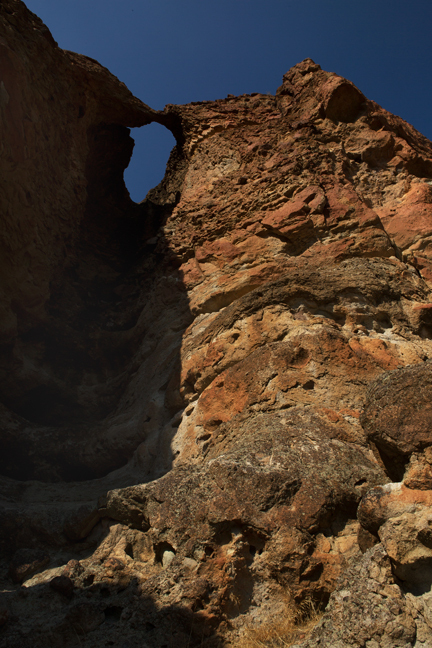 Vertebrate fossils are continually being exposed through natural erosion. 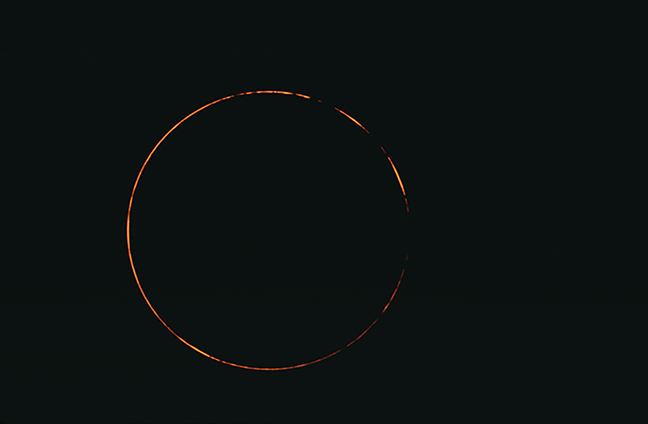 The 1984 annular “diamond necklace” solar eclipse. 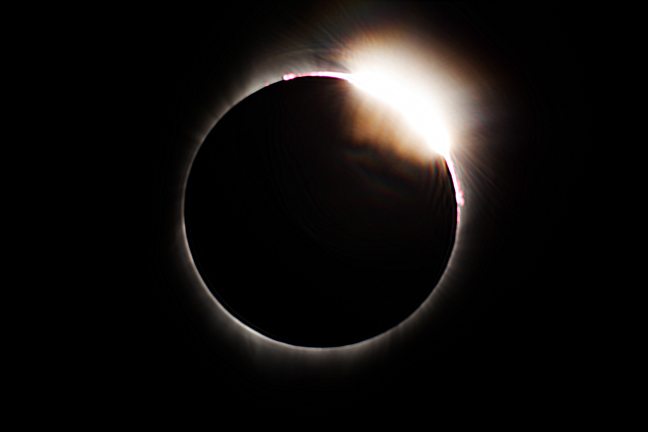 The Diamond Ring Effect is unique to total solar eclipses. Just before Sun disappears or just after it emerges from behind the Moon, the Moon’s rough edge, or its lunar limb, allows “beads” of bright sunlight to shine through. These beads are called Baily’s beads, in honor of British astronomer Francis Baily who first noted them in 1836. 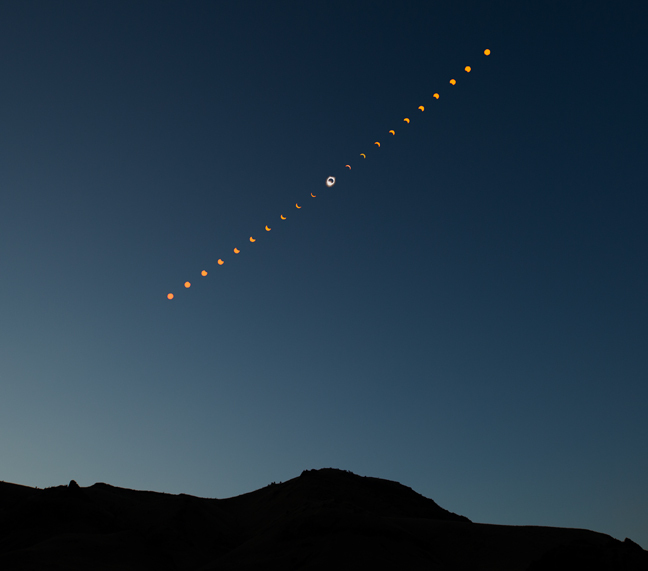 Nine exposures are combined into a composite image. The camera, with a 400mm lens, remained stationary as the Earth and moon rotated along their orbits. 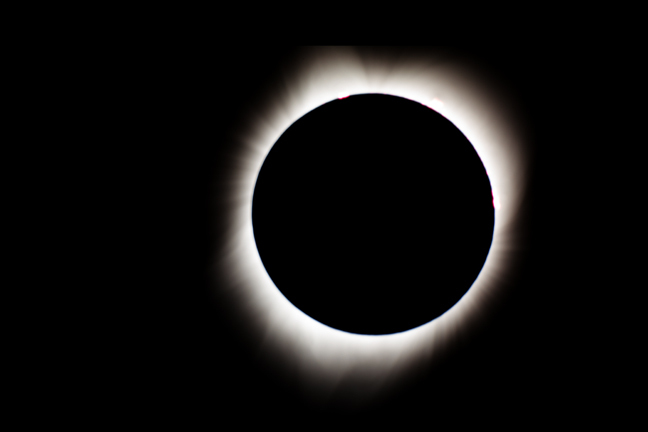 The gap between images of the "Diamond Ring" phase and Totality was slightly expanded along their true axes to prevent overlap in the composite image. 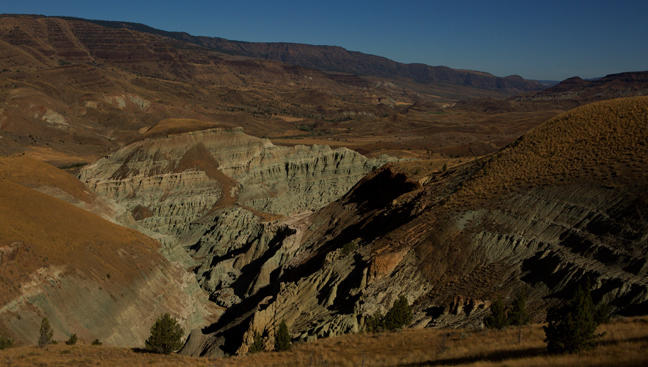 A 22-exposure composite image from John Day Fossil Beds National Monument. Exposures are approximately 7.5 minutes apart as the sun moves across the sky.